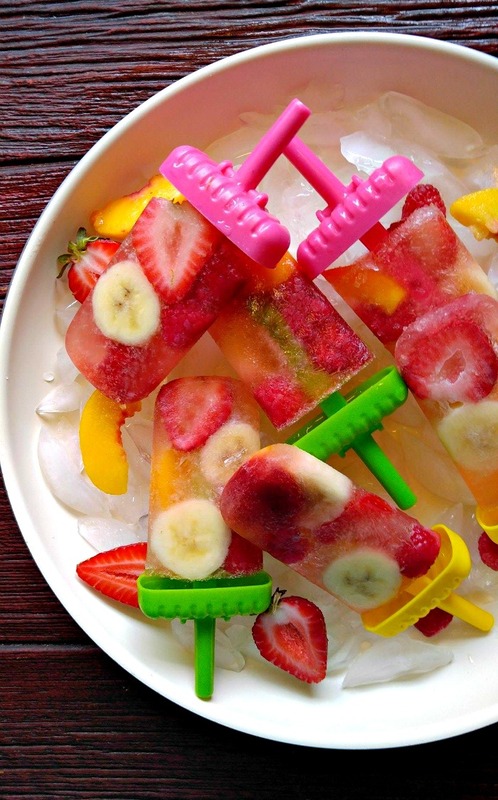 Frozen icy pops are a fun and refreshing sweet treat to enjoy during the hot summer months. They are very easy to make and the sky is the limit when it comes to ingredients that you can use. These home made Popsicle Recipes show that it’s easy to be cool in a tasty way. They are the perfect addition to your collection of cold summer desserts. Have you ever made popsicles at home? They are so much easier than you might think. Making these frozen treats yourself allows you to control just what you put into them and keep the sweetener content lower than store bought pops that are normally full of sugar. Be sure to check out these tips for making popsicles at home. Is the heat getting to you? Nothing tastes better than a fresh-from-the-freezer ice pop. These sweet treats are a favorite of both kids and grown ups alike. Whether you are looking for homemade popsicles, frozen fruit pops, pudding pops, boozy options, ice cream pops, or homemade fudgesicles, I’ve got you covered. 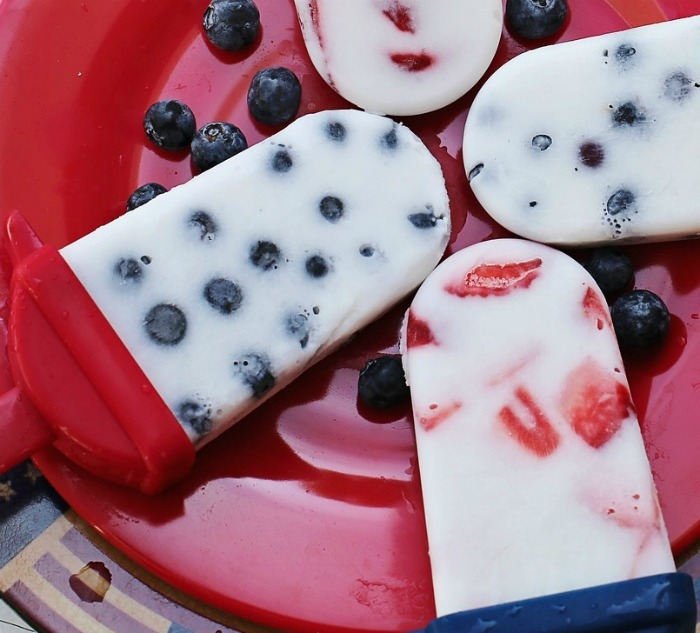 Fly the flag with these patriotic popsicles. The red white and blue color is amazing and the taste is too. Super easy to make and your guests will love them! Be sure to keep the kids away from this frozen treat! These pina colada pops are lightly infused with Coconut rum! The pineapple and coconut flavor will make the grown ups think they are on a mini vacation! These frozen strawberry yogurt pops have a creaminess that comes from the Greek yogurt. They are lightly sweetened, super easy to make and taste great, too. Forget the Popsicle molds. Home popsicle recipes can be easier than that! Just freeze banana halves and then coat them with your favorite chocolate spread and toppings. 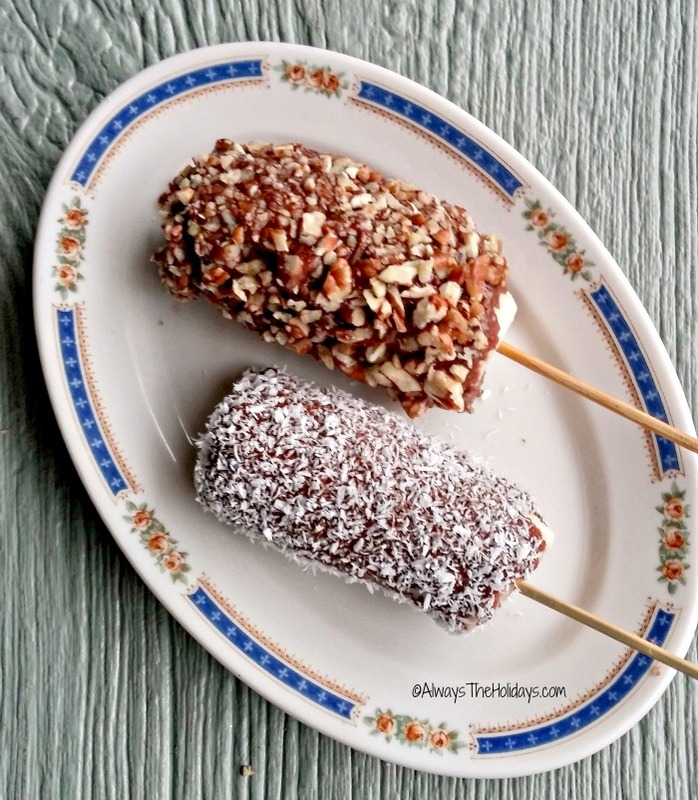 These banana pops use a Paleo nut butter to make them gluten free. Watermelon is in season in the summer and it pairs nicely with mint and coconut milk. 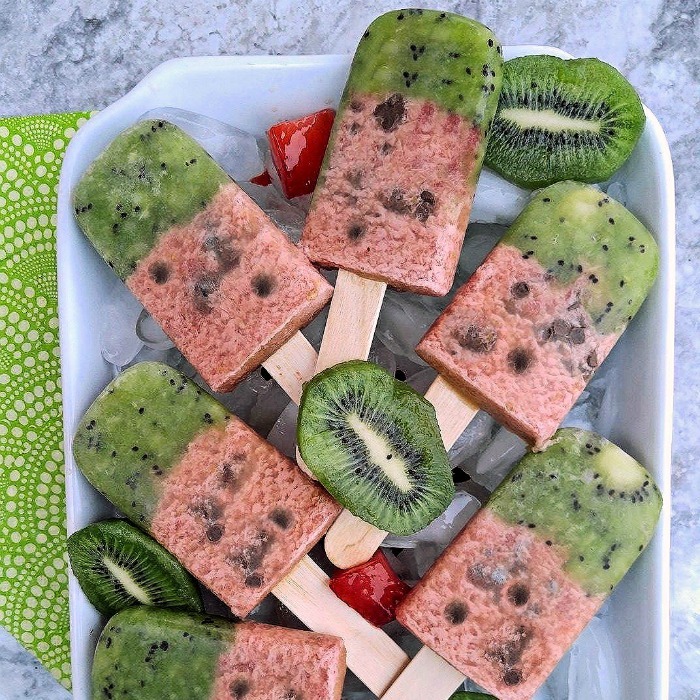 These Chocolate Watermelon pops have a few mini chocolate chips for some extra crunch. Only 55 calories each, too! 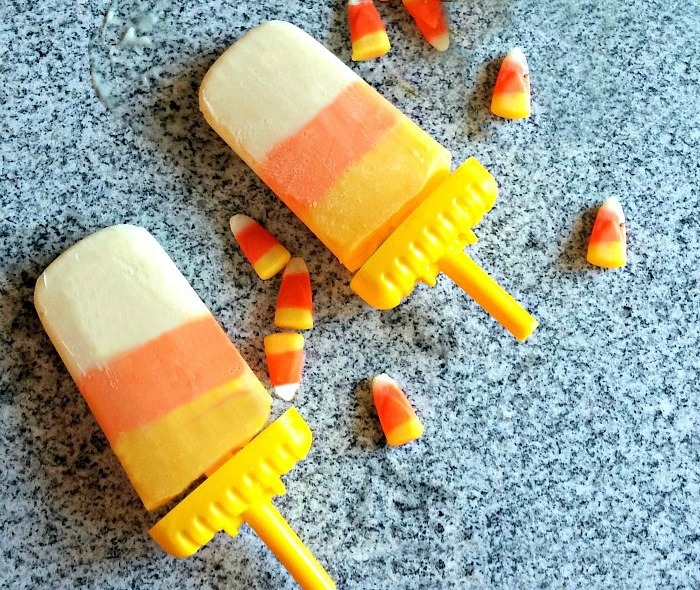 Food coloring and pudding come together in the look of a favorite fall candy with these super tasty candy corn pudding pops. It will be Halloween before we know it and the kids will enjoy these sweet treats with thoughts of trick or treating to come! Who doesn’t love the taste of chocolate and hazelnuts? These chocolate hazelnut frozen pops use a Paleo version of nutella for a frozen sweet treat to tempt both young and old alike. Last, but not least, is a boozy champagne Popsicle made just for the grown ups. You won’t believe how easy they are to make! Is the heat still getting to you? Try one of these frozen pops out for size! Lemonade Strawberry Popsicles – Two of summer’s favorite treats in one frozen pop. Raspberry Cream Popsicles – Also get Dairy free and low sugar options, too. 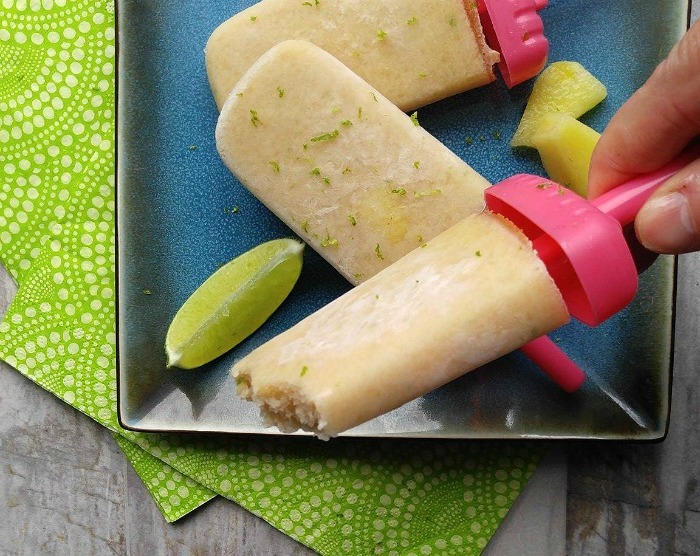 Limeade popsicles – Combine lime juice and simple syrup to make these tart and hydrating pops. Blueberry Cheesecake Popsicles – with a name like this, who can resist? Chai Tea Latte Popsicles – Refreshing and cool and made with real cream. Avocado Popsicles – Your favorite nut milk, honey and fresh avocado makes these creamy frozen treats that are super healthy. 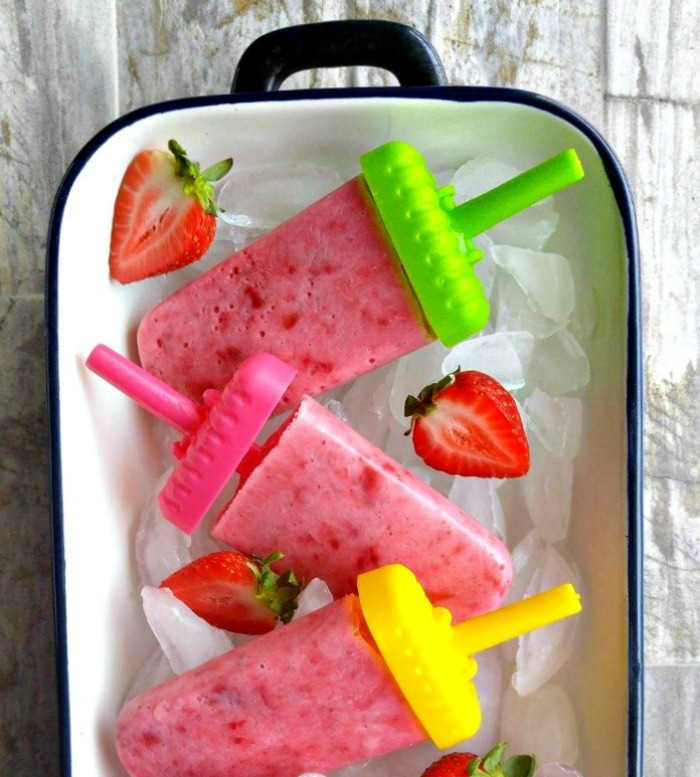 Strawberry banana smoothie pops. These frozen treats are the best of a smoothie and a Popsicle.combined. Oatmeal Smoothie Breakfast Popsicles – A frozen treat for breakfast on the go. Green Smoothie Popsicles – These frozen pops have a dose of spinach for a healthy treat. 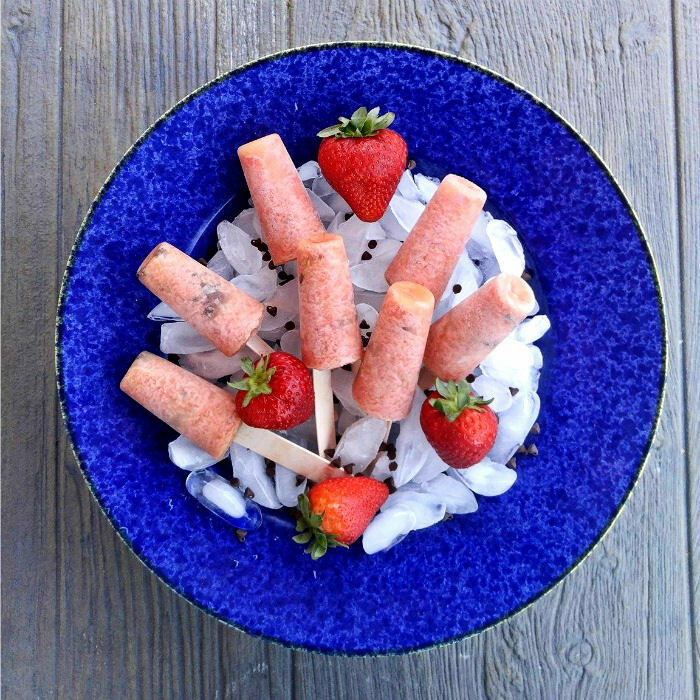 Strawberry Chocolate Pudding Pops – A generous helping of chocolate pudding gives these frozen pops a rich flavor. Cat in the Hat Pudding Pops – The kids will love these colorful frozen treats. Sprinkles Pudding Pops – The easiest ever fun frozen pop. 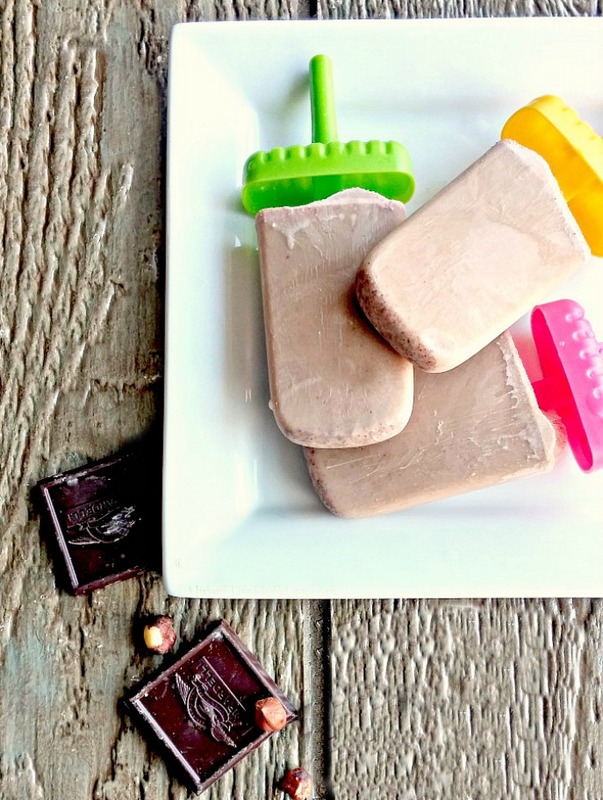 Double Chocolate Cashew Milk Popsicles – A healthy and yummy fudgesicle type sweet treat. Peanut Butter Banana Fudge Pops – Three of my favorite tastes in one delicious frozen treat. Chocolate Dessert Frozen Pops – These dipped treats are easy to make and super tasty and fun. Cherry Limeade Ice Cream Pops – A half scoop of vanilla ice cream goes into these pops! Salted Caramel Crunch Ice Cream Pops – Chocolate, caramel and ice cream all packed into one frozen bar. Are you fond of popsicles? Which type is your favorite!